If you’re looking to include or add an energy storage feature to your solar system, you’ll want to get the best price possible. Although the federal government offers an Investment Tax Credit (ITC) for solar systems, it can take a careful read to discover what the credit actually covers. In this post, we’re going to discuss solar batteries, specifically. If you’re ready to design and install a solar system, give us a call today! The investment requires that you own your solar system, which means a system is not eligible if it is leased. If you are eligible, you can then claim the ITC against the cost of your solar system. However, a solar battery isn’t considered “renewable energy,” which means by itself, you cannot claim it towards your ITC. Your solar battery is only eligible if it is a component to a solar system installed and is being recharged by renewable energy. If your battery is being charged in portion by the grid, its cost is not eligible when the ITC is claimed. As mentioned briefly above, a battery charged by the grid is not eligible for ITC. If your battery is charged by a solar system 100 percent of the time, it can be included in the ITC claim with your solar power system. On commercial property ITC claims, a solar battery can be included if it’s being charged by renewable energy at least 75 percent of the time. The amount of tax credit allotted is determined by how frequent the battery is charged by renewable energy. If you want the full tax credit for your solar battery, it needs to be charged by solar power 100 percent of the time. As an example, a battery that is charged by solar power 90 percent of the time will only be eligible for 90 percent of the tax credit (90% x 30% = 27%). In this example, if the battery cost $6,000, then you could claim $1,620 with the ITC ($6,000 x 27% = $1,620). Are There Other Financial Incentives for Solar Batteries? 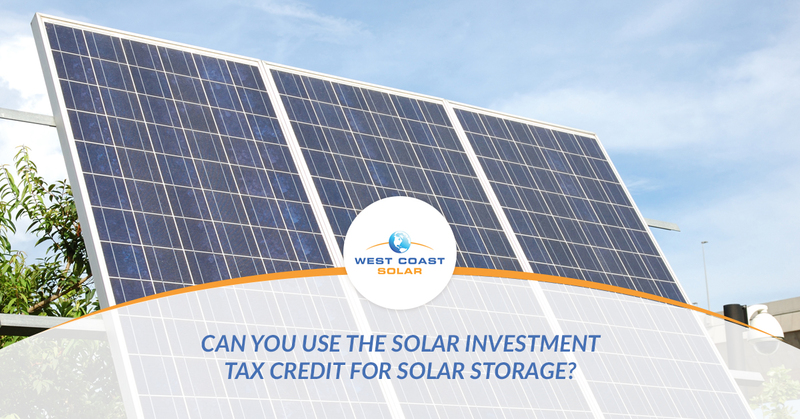 The Solar Investment Tax Credit is the largest federal incentive available. California residents may be able to take advantage of what’s called a Self-Generation Incentive Program (SGIP), which provides rebates to existing, new, and emerging energy distribution resources. Although energy storage is a relatively new technology in the renewable energy sector, it’s seeing great improvements and support as the technology and accessible increase. Whether you want to save money on your utility bills or help the environment, West Coast Solar is here to help you achieve your energy goals. We offer solar system design, installation, and financing to ensure you get the best solar system for your home or business. Give us a call today to get started!